Aspen Spin: Why? Because it's there!! 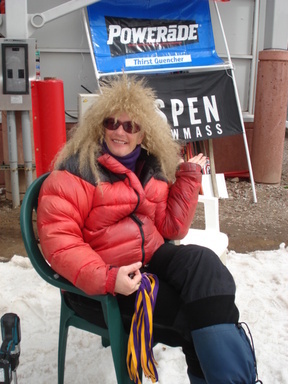 Aspen is known for it's glitz and glamor. It's known for it's skiing, it's partying and it's high priced real estate. However, many often forget that Aspen is home to some of the SICKEST athletes in the universe. 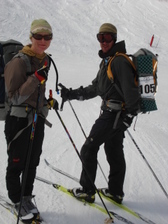 Aspen recently hosted the finish line for the 10th Annual Elk Mountain Grand Traverse. The Grand Traverse is just a simple over-night race from Crested Butte to Aspen. It's only 35 or 40 miles as the eagle flies, but there's plenty of uphill action along the path. Some of you may have made the challenging hike during the Summer----when it's manageable, but I doubt any A-Spinners have the cajones to do it in the Winter, when you have to risk your life to make the trek. Click on www.elkmountaintraverse.org for more details. The 2007 edition of the race was made even more difficult by the "worst weather conditions in the 10 year history of the race" according to the race director Jan Runge. One hundred and thirty one, 2 person teams lined up with their packs, skis and all the required gear including avalanche beacons, shovels, flares and a stove to melt water if you get stuck in the back country. The absolute minimum weight for the racers packs was about 25 lbs. 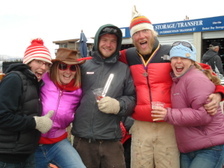 At the stroke of midnight when most of us are either drunk or asleep the 262 racers set out from CB to ski to Aspen. The next morning at about 8.46 a.m. the winning squad skied down the icy slopes of Ajax to a well deserved victory. As the teams trickled in, all the racers seemed relieved and ready to party. Some of the finishers shared their views with A-Spin. 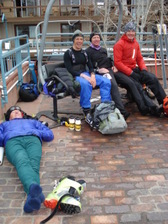 Brian and Brian from Crested Butte told stories of the sustained 60 mile an hour head wind. One of the Brian's who was sacked out on the brick pavers, could only mutter "It was sick, dude". Jesse, from Gunnison, who's the ski coach at Western State University kept mumbling about the "ground blizzard" and the "gale force winds". The last few teams came in around 2 p.m., 14 hours after starting. When they got to the top of AJAX and realized that they had to ski down the steep slopes on their skinny touring skis after spending the entire night out in the blizzard-----they sucked it up and pointed 'em down hill. Glo, a beloved Crested Butte local icon was on hand to greet all the finishers and present them with their well earned medals. Glo the self appointed "hostess" of the event made sure each and every racer felt good about their accomplishment. Aspen Spin is in substantive talks with the famous Glo to create CB Spin. Look for it in your spam next season.